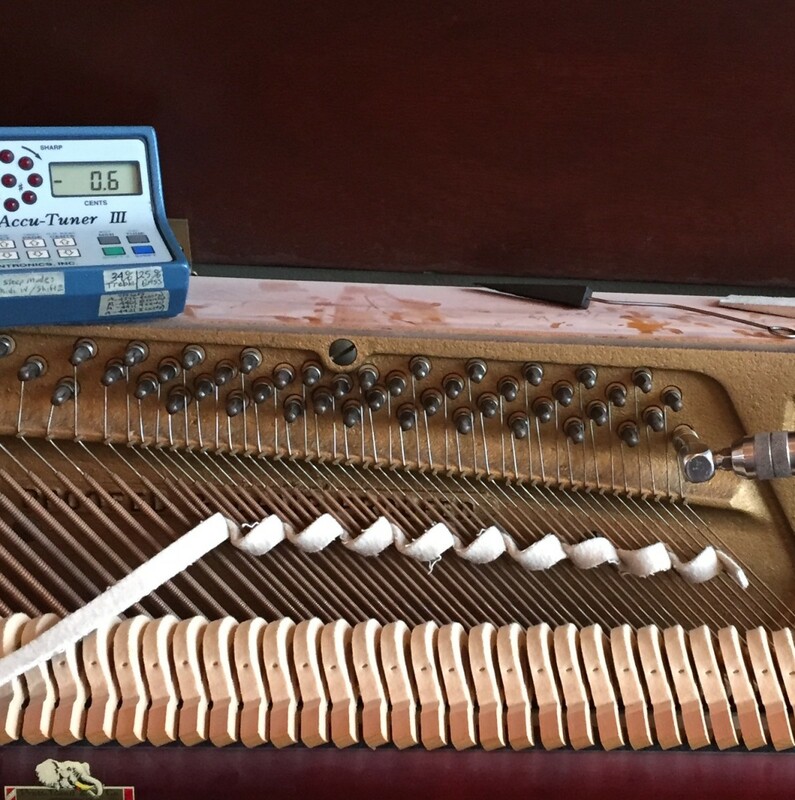 What Techniques and Skills to Expect When a Piano Is Tuned by a Professional. This Example is in Missouri. Loretta began playing piano at age 7 and hasn't stopped. From the classics to ragtime, playing the piano has been one of her greatest joys. First, I have to tell you something. 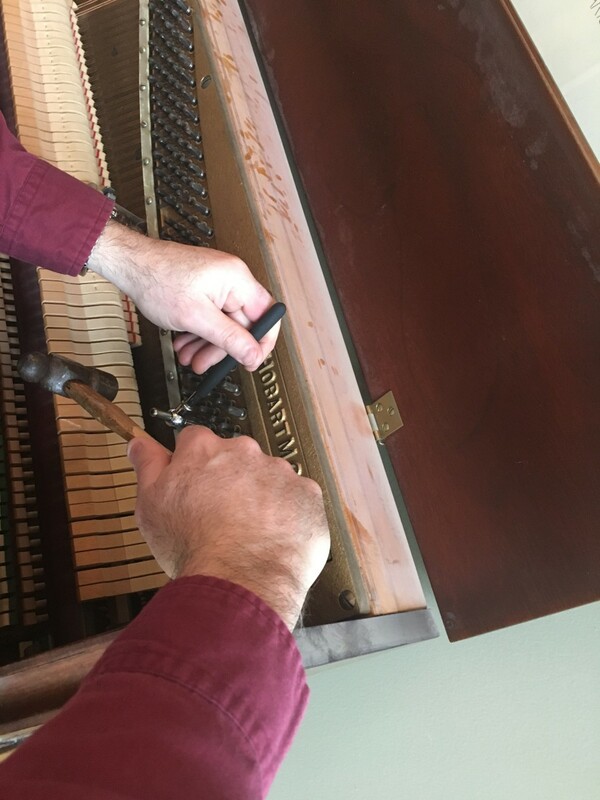 Our state does not require any type of training or certification to call yourself a "piano tuner." You simply go down to City Hall, give them $25, and you get a business license to tune pianos. Hairdressers need certification, massage therapists need certification, and electrical contractors need certification, but not piano tuners. That is why I think it's important for you to know what to look for. Otherwise, you can get ripped off and end up with a piece of junk. Ask who the clients are. A reputable service will have schools and churches as ongoing clients and also have many individuals as repeat business. If they are hesitant to give referrals, keep looking. A reputable service will also have a distinct price list, not just charge by the hour. 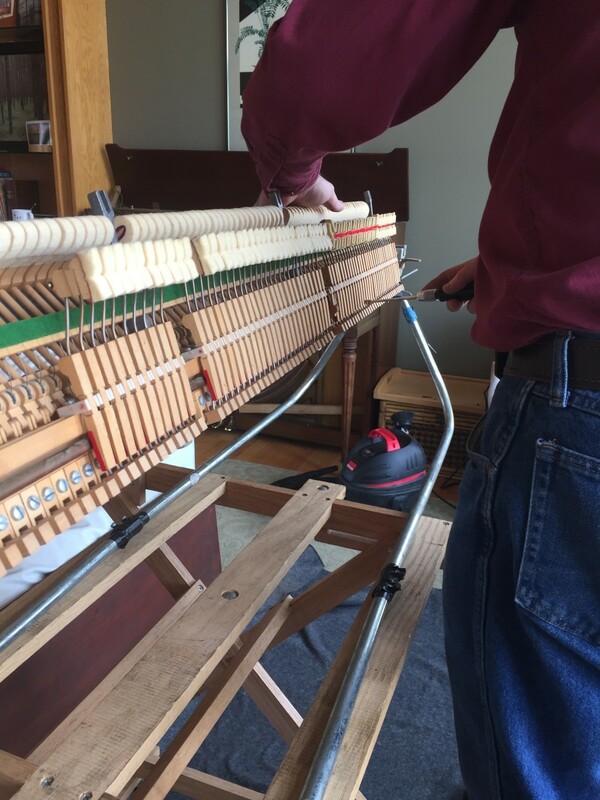 Your piano may require one of something, two of something else, and none of a third thing. A set price list is your friend. A service fee is to be expected, just to come look. Disclaimer: I am only speaking of where we live. Another country, state, or city may have strict requirements that I would not know about. Since I have a console, that is what will be covered. 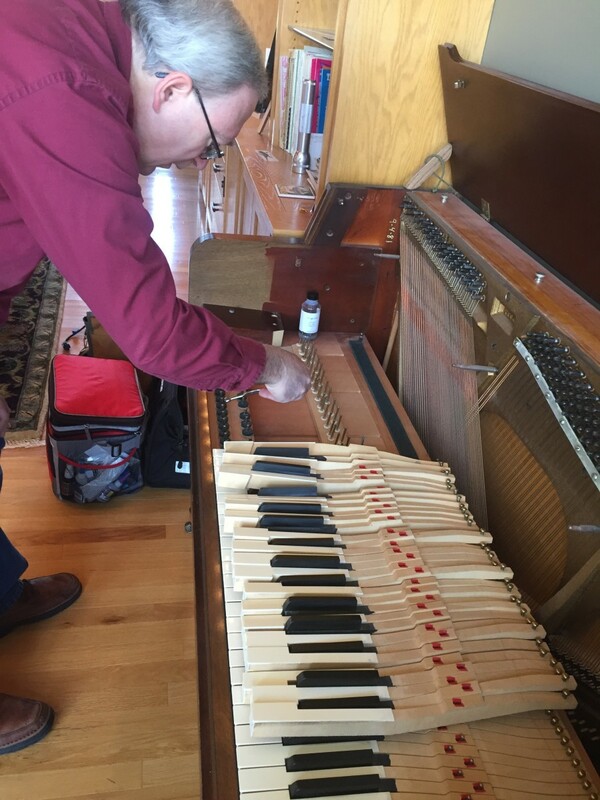 A spinet and upright will have a similar method of service. 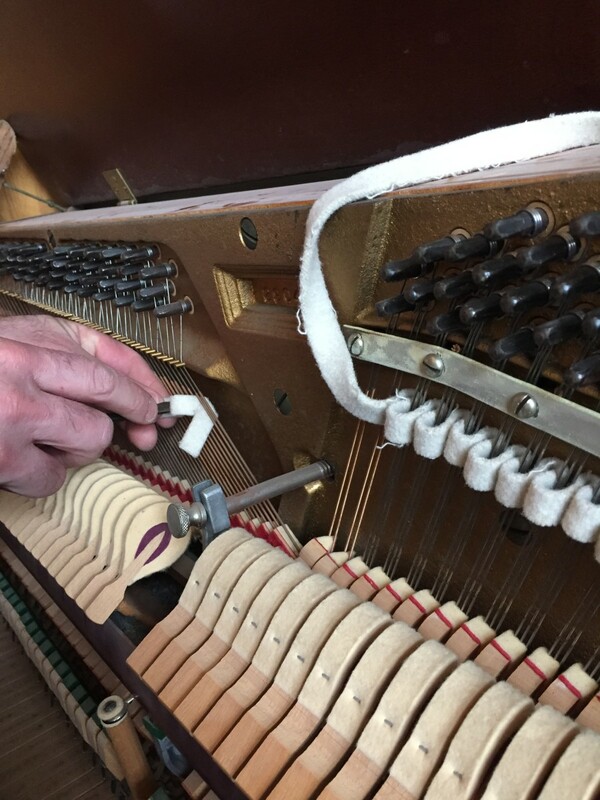 A grand or baby grand will be different but if you are looking for a technician, he or she should be skilled on this order with similar tools and exacting standards. Be sure to view each thumbnail. The captions have information also. 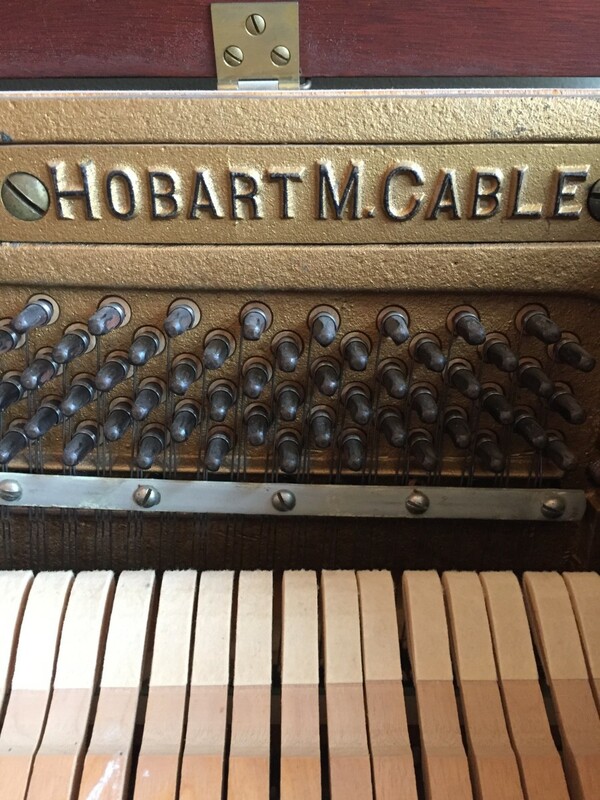 We own a 1958 Hobart M. Cable purchased by my parents in the early 1970's. Note the pins with an individual wire wrapped around them. Three pins, three wires, struck by one hammer from one key. 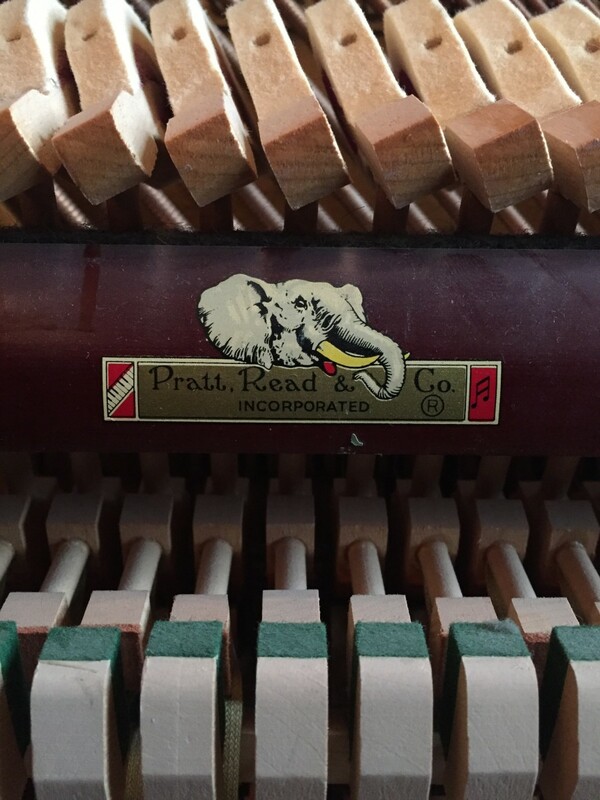 This company used to make the ivory keys. After being outlawed they now make other components, especially the action. The pins are the little metal posts that go into the sound board. The wires for each key are wrapped around these pins. Actually three pins and three wires (strings) for each key. These can wiggle forward, away from the sound board, from many years of use, from changes in humidity, or from being moved from one place to another. 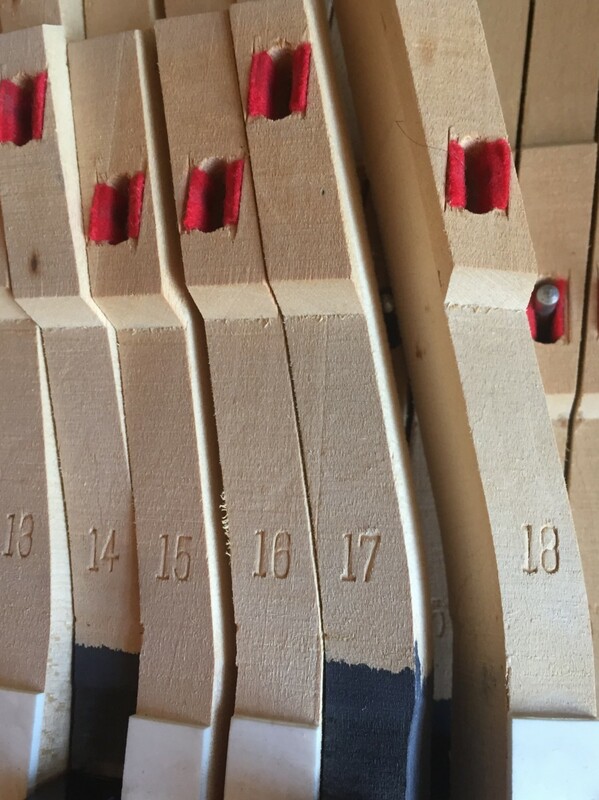 Each pin is tapped firmly, but not pounded, to push it back a bit into the board. If you can notice from the tapping photo, you'll see this sound board is glued together in a few layers. This is a good thing. A solid piece of wood, that is not laminated with glue, may be more prone to rot, and also allowing the pins to become looser, sooner. With glue in a layer, rot will stop at that point and it gives something additional for the pin to grip. In case it needs stating, my technician was happy for me to take his picture during the process. Tapping each pin firmly into the sounding board. A special tool encases the pin so it is not hit directly. Enlarge to see the thin separate layers that are glued together. This photo was taken before vacuuming so it's a little hard to see. The center of the three strings (wires) needs to be adjusted first, before the two outer strings of the note. This means the outer two strings need to be stabilized. There are a couple of ways to do this. One way is to softly wedge a 4-5 inch long rubber stick beside each group of three wires. Some technicians prefer that method, so if you see that, it's okay. They may use several rubber sticks at a time isolating a few notes at a time and work on those. My technician uses a long piece of narrow felt. This is wedged around each group of three strings. This means that of each of three strings, the outer two are stabilized and will not respond to the hammer - only the center string will respond to the hammer when the key is struck. Preparing to isolate all center strings to work on them at the same time. More stabilizing. See the three strings snuggled between the felt loops? This begins one of the most time-consuming tasks for your technician. The center string is adjusted to pitch, individually. Striking the key causes the hammer to hit the center wire and the sound is produced. The pin is turned with a special tool to get the correct pitch as determined by the meter. This is repeated for all 88 keys. The process is repeated for the two outer wires! They must now be brought into pitch to harmonize with the newly adjusted center wire. Note that any wire can only be adjusted so much in one pass. That means that your 88 keys may need two passes of this process if it is really out of tune. Oy vey! A reputable tuner will have a price for this pass and he will tell you up front what it is, and how many passes he expects to make. My piano had not been serviced in a decade (don't judge me) and he had to make two passes. At least it wasn't three. Notice the blue meter box at the left and the black turning tool on a pin at the right. This tool will turn the pin bit by bit until the pitch is correct as evidenced by the meter. You'll want to have a pot of coffee on hand. At some point, all the keys will be removed. This is when all the dust bunnies and gold paper stars from lessons gone by will be revealed. Egad. And I thought under the bed was bad. Each key has two divets, mine being lined with red felt. One is on the top for securing there, and one is on the bottom, for securing from that side. There needs to be wiggle room here. 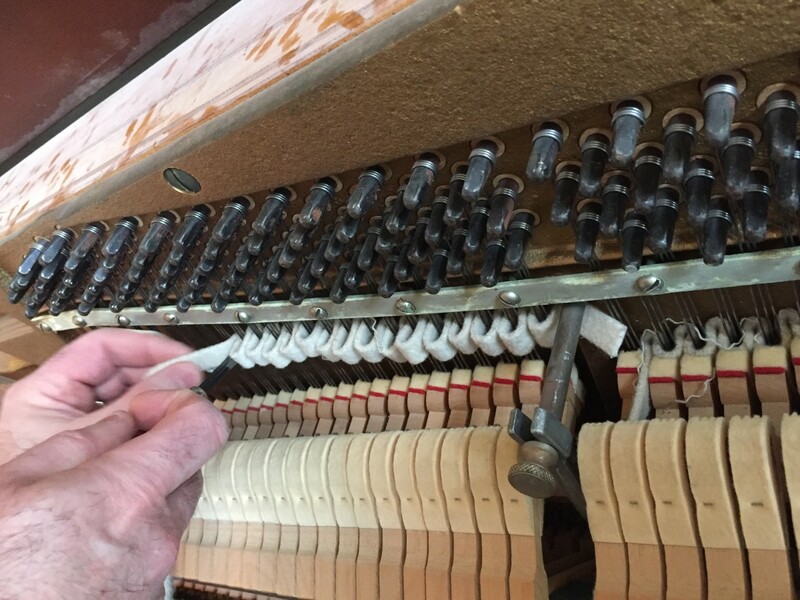 Humidity or wear can cause these little holes to swell, and that can be one reason for keys that stick when you play. My technician used a special size tool to slip into each red divet to ensure the space was correct. Re-seating the keys. Each bottom pin was also lubricated for ease of movement. Who knew a key was so long? They are numbered so you can't go wrong! My action was taken outside and dusted off with an air compressor! Seriously, the "action" is the whole mechanism that allows the keys to be depressed (not in a sad way) which fires the hammer which strikes the strings. That Jack built. The action has need of a lot of adjustments. There is a screw for each hammer, and a screw for each damper, and a whippen or five may need attention. That's a lot of work. My technician built a sort of wooden scissor-lift and a metal stand to hold the action at a comfortable working height. This allows him to adjust the screws at one angle, turn the whole thing over and adjust from the underneath angle. The action outside getting dusted with a compressed air unit. The action on a home-made rotisserie. Every time I hear the phrase "put the pedal to the metal" I think of piano playing. It's supposed to mean "drive really fast", but whatever. Your pedals may need some adjustments, or at least a good vacuum. Mine needed both. My technician told me the two weirdest things he had ever found inside a piano. One was a kite, the old paper kind shaped like a diamond with a tail, and the other was a grilled hot dog. Two different pianos at two different times. Otherwise it could have been at a cookout somewhere. All Done and Ready to Play! 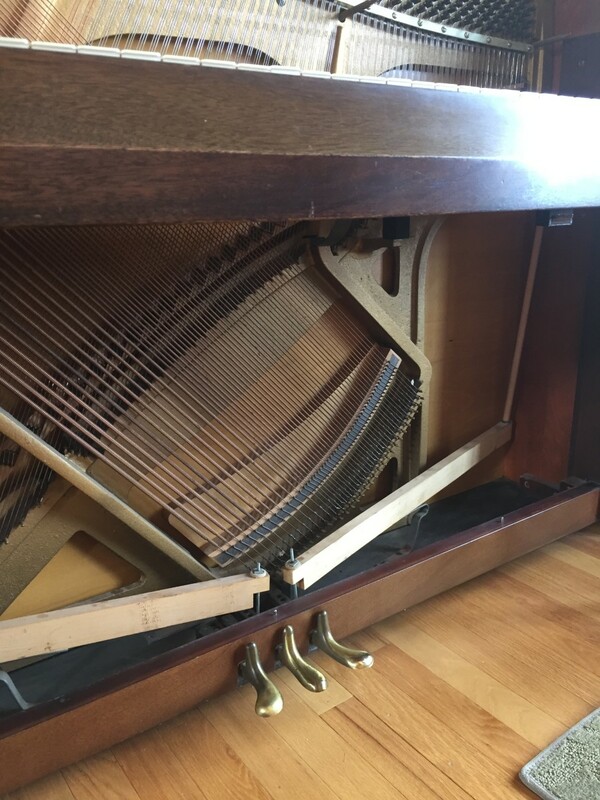 At some point, all the pieces laying around your room will be re-assembled and your piano will play like new. It's a good time to polish the case with lemon oil so it will look new, too. My ruby red slippers are from my retirement party. All I wanted to do was go home. You may have an idea of pianos, but for those who don't I will provide a basic list of common models. If you are doing research in order to purchase a piano this might be a starting point for you. 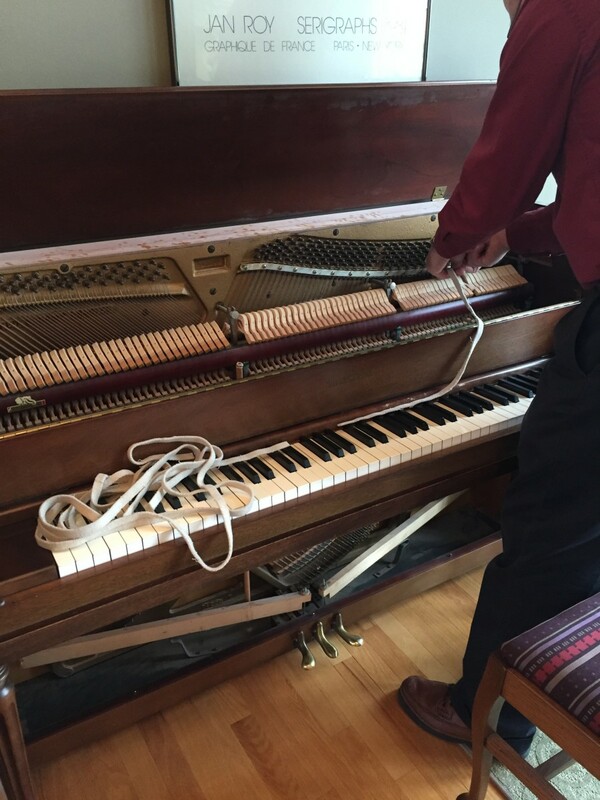 If you are considering a purchase, don't be afraid of a used piano. 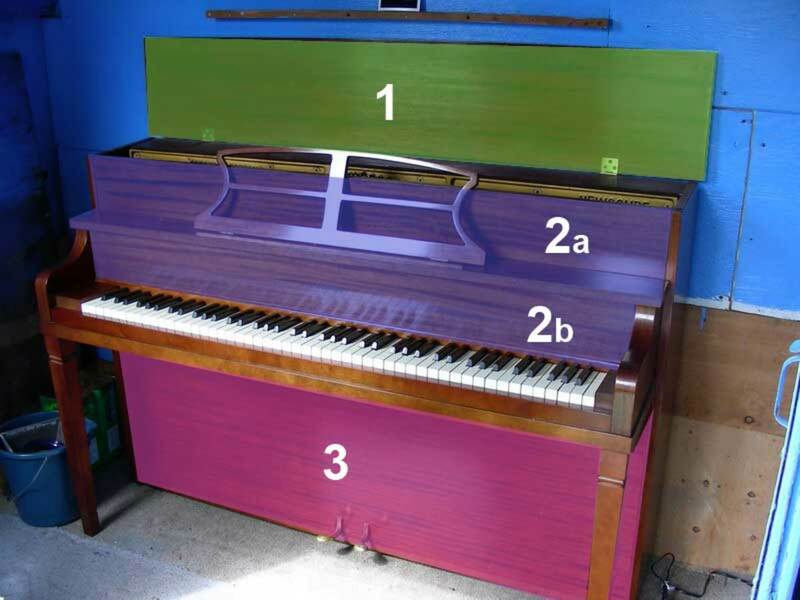 An individual old piano can be a better choice than an individual new piano. 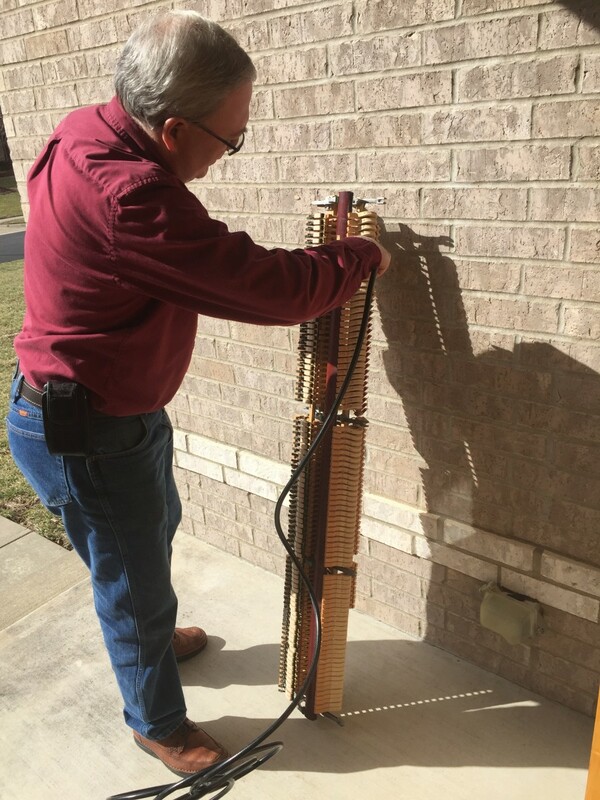 This is the smallest vertical piano. Usually cheaper than others, but for a reason. 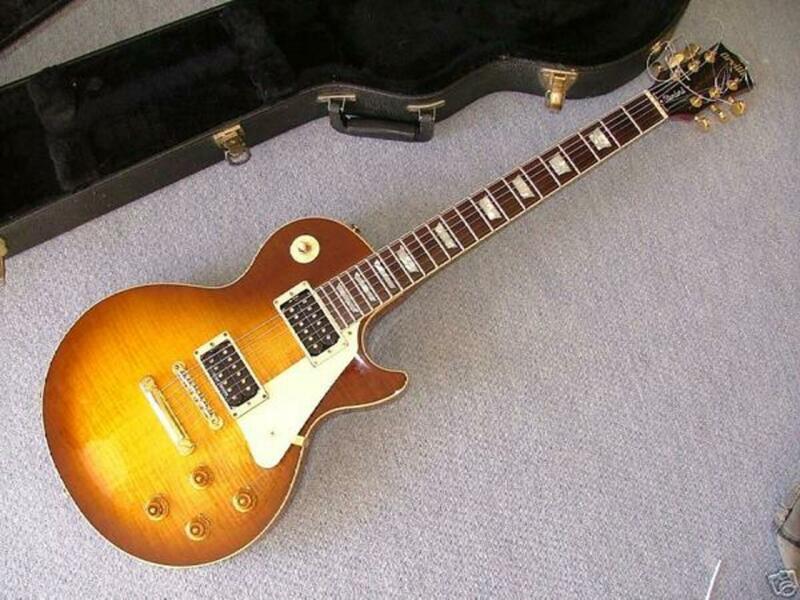 These have a shorter sounding board, shorter strings, and won't keep tuned for long. This style might be good for infrequent playing, to see if a child wants to progress to a higher level of play, or because of size requirements in a residence. 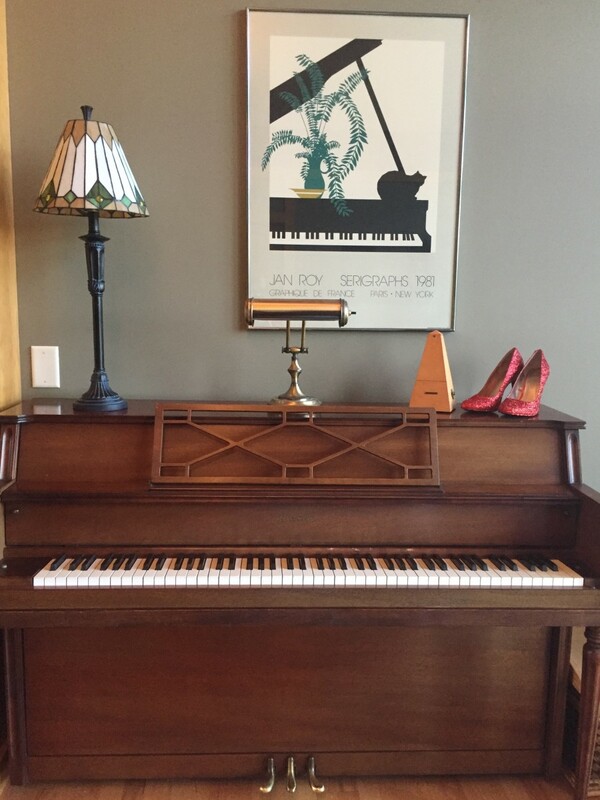 A console is considered as a step up from a spinet. This can be a good choice for several reasons. 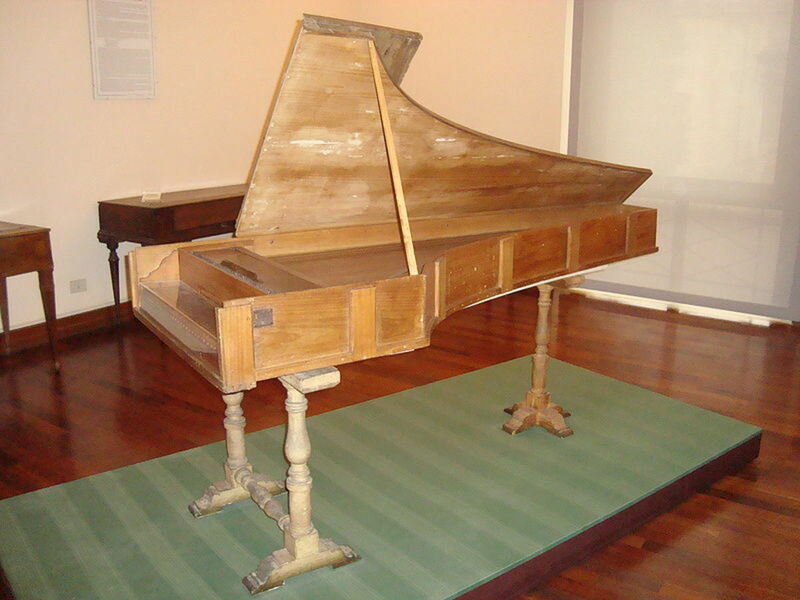 Like a spinet, it does not use a lot of floor space if that is a concern, although it is somewhat taller. 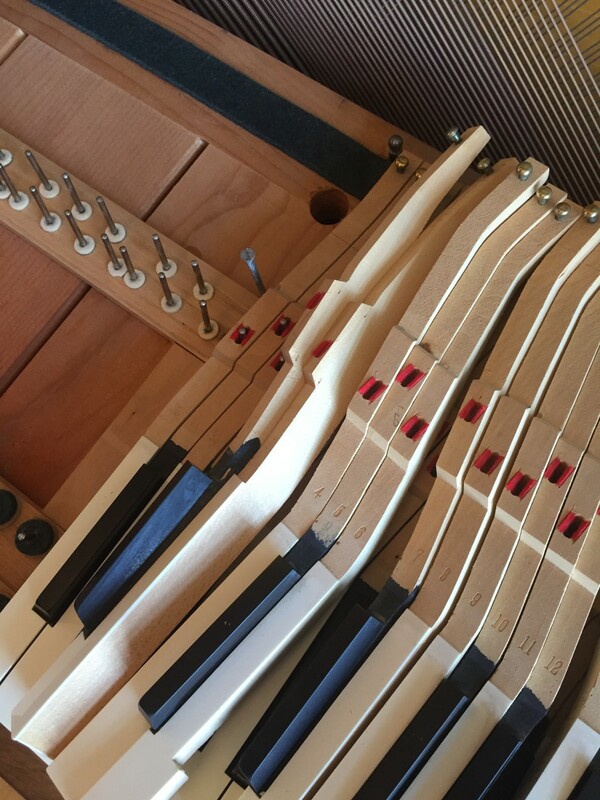 With a larger sounding board and longer strings it keeps a tune for a longer time (depending on humidity, being moved around) than a spinet. Taller than a console, this gives even more ability for getting and keeping a good service. Having a larger cabinet than the previous models it gives a bigger sound. Depending on individual embellishments, this may take up more floor space than you like. However, that can be a reasonable trade-off if you want the additional size of the sounding board and the overall effect. Jimmy Durante was a famous upright player, as was Scott Joplin. These things are massive. My parents bought one for me in the early 1960's, but it was made long before that. As an older model it had ivory keys, which you cannot find these days. It had heavy carving on the legs and on the sides. I loved that thing. An upright grand is not a horizontal grand that's been turned vertical, instead it's a huge upright. Having a bigger cabinet gives an even bigger sound than a regular upright. You have probably seen baby grand pianos. Some lucky homes have them as do schools, churches, and other public venues. They are smaller than a grand, of course, but can be more affordable and take up less floor space. The basic mechanics are similar to the grand, just a smaller scale. (No pun intended). While all the previous models use vertical sounding boards and wires, the grand and baby grand use horizontal components. Here we are - the grand piano. 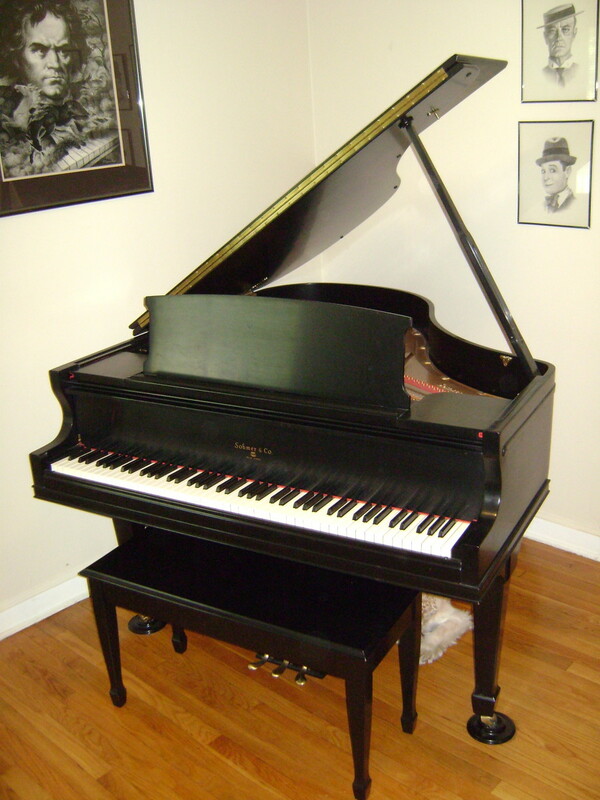 The huge, magnificent, glossy black piano favored by Liberace, Victor Borge, and many others. The sound and response of a really good grand piano is unbeatable. Having a horizontal sounding board and other workings means a completely different service method, but the detailed steps should be similar to the service described. Buying a Used Piano? What to Look For. Buyer Beware. Thanks. I will have to check them out!! I see you, Ms Dora and others have things on these sites. At the end of your feed here, you can find a list of HP's network sites. I suspect you will have more of your material moved to those sites because you are a superb writer. Usually, getting an article on a network site can help your traffic, too. HubPages is a network of sites where people write about their passions! Hi Ms Dora - He showed me some photos on his phone that I thought were impossible to save!! 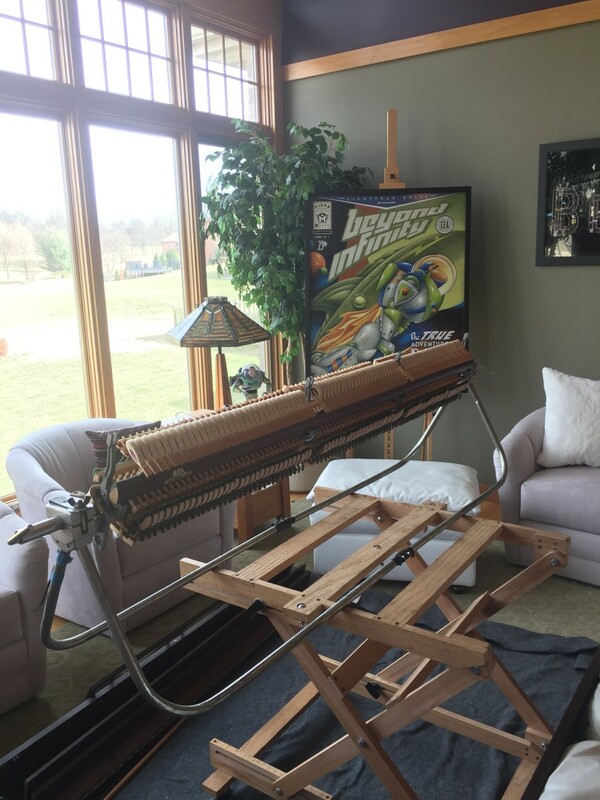 He's completely rebuilt pianos that were falling apart. Just amazing what can be done. Thanks for checking it out. I see HP has moved this article to Spinditty, which I didn't even know existed. Looking at that first picture, I wouldn't think that it was repairable. Thanks for walking us through the repair and teaching so how much about pianos in the process. Very helpful! Yes, Loretta, My poem is on my profile. It's called: Teaching in Poetry: A Poem for My Piano Teacher." She loved gospel and jazz and taught me to "feel" the music and "go with improvising" to my heart's satisfaction. It helped I grew up a fan of Coltrane. In fact, I totally rejected classical initially until I learned just how much jazz and classical really need each other. Yes, but without a great piano in tune, none of it sounds right. Yes, I would like to read it! Can I find it on your profile page? Definitely agree; Gospel and Ragtime have their own particular sounds! The massive upright we had was perfect for ragtime, and actually gospel as well. My teacher at the time taught me small embellishments of chord structure and inversions from the hymnal. Orchestration is beyond me. I would never be able to arrange a piece for a variety of instruments. What a great talent that must be. Good for you in having that ability. Thanks yet again, and let me know about the poem. I agree on an important point about pianos: it's practically impossible to get that "church" piano sound from an electric piano. Tuning is a must when playing those old southern gospel hymns. I wrote a poem to my piano teacher if you ever want to read it. I would love to hear your thoughts since we both have a love of the fabulous King of the Instruments. Playing piano helped me develop my "arrangement and composition skills," meaning over time, I learned how instruments should sound together. It was useful for band work. Yet, an out-of-tune piano helps nobody. Your article is a gem in that regard for guidance. Loved it and thank you. Coming from someone with some background in piano tuning, that is especially nice to hear! Thank you. It's amazing that piano tuning was an elective in high school. I never heard that around here. I played an electric piano as the lobby pianist for the play "Ragtime". 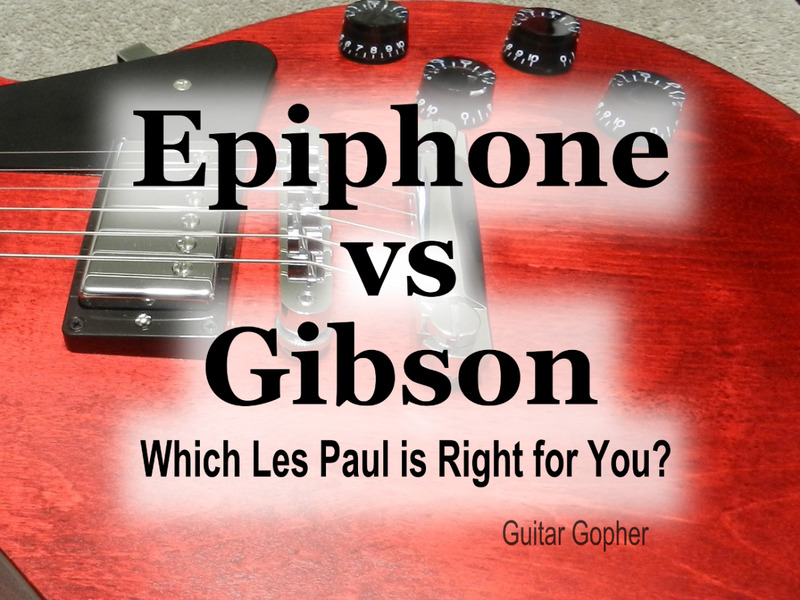 I didn't think blues, ragtime, and boogie-woogie could sound good on an electric, but it was quite good. I forget the brand now. That experience changed my mind about electric pianos. I really liked it. Thank you again. And keep warm in the coming deep freeze this week. Wonderful article, Loretta. I'm probably one of a few people who actually took piano tuning classes in high school as an elective. Unfortunately, the man training me got a long time gig with a jazz band in Chicago and he never was replaced. Yes, I recall all of those lessons and you described it masterfully. However, I did continue to play piano, but I never was able to finish my training in tuning. Great advice. 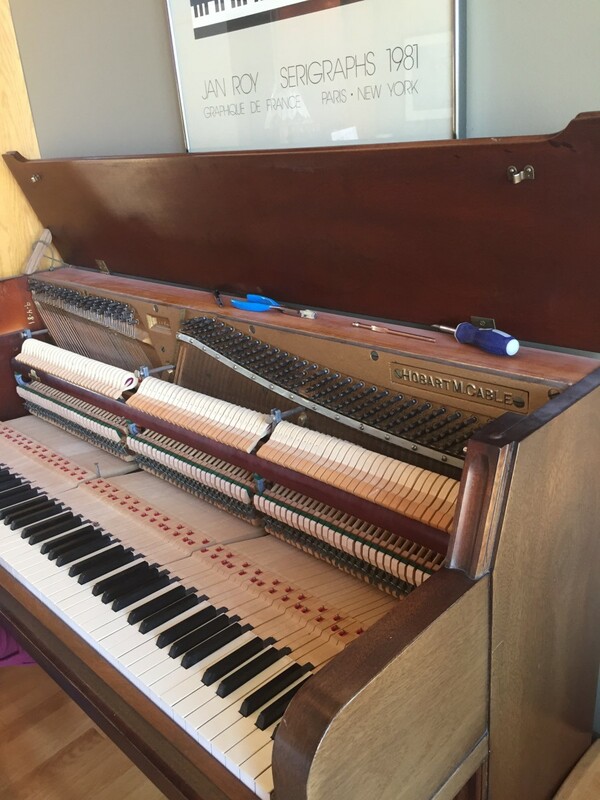 When we have the church piano serviced, it's always by an old gentleman who knows his craft, having hundreds of clients in this area. Enjoyed reading this, and now, Loretta, I prefer my Yamaha electronic keyboard. Thanks again for a well written, informative, and educational article.